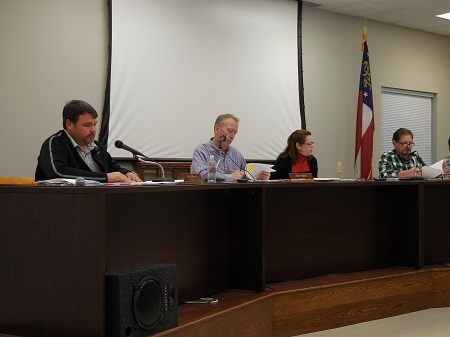 BLUE RIDGE, Ga. – The Fannin County Water Authority will see a new board member in March while other departments saw reappointments to boards during the Feb. 13 Fannin County Board of Commissioners (BOC) meeting. Post 2 Commissioner Larry Joe Sosebee made recommendations for both the board of the Fannin County Water Authority and the board of the Fannin County Tax Assessors. Sosebee’s recommendations were met with approval of fellow BOC members. Janie Bearden, a current member on the Board of Tax Assessors, saw reappointment to this board for another term. Another reappointment came to the Fannin County Water Authority as Larry Chapman was unanimously approved to serve another term. Board of Commissioners get straight to business at February’s first meeting. Angie Arp was also recommended by Sosebee for the Fannin County Water Authority board and was unanimously voted into this position. This three-year term will begin on March 1. The BOC’s first monthly meeting opened with public commentary that brought about discussion from the board as well as from Fannin County Sheriff Dane Kirby. Sims suggested possible solutions such as requiring these haulers to have hard top covers or begin strictly enforcing the county fines and issuing tickets for the maximum amount of $1,000. Helton believes that current county ordinances address this issue, and it is just a matter of finding an effective way to enforce the laws. Chief Land Development Officer Marie Woody is tasked with imposing these ordinances. Unfortunately, Woody is only able to ticket these offenders if caught at current waste disposal facilities, and as Sheriff Dane Kirby pointed out, officers are unable to ticket offenders unless they personally witness the act. “It’s a state law, in the state statute, that you can’t make traffic offenses based on what somebody else tells you,” Kirby explained. Commissioners along with Kirby agreed to be more vigilant about this issue and pursue current county ordinances and fines in dealing with offenders. Kirby, while not on the agenda, had an emergency expenditure arise that needed the board’s immediate approval. The dishwasher in the county jail recently quit operating, and upon inspection, it was recommended that the stove in the jail also be replaced. Both appliances have been in use since the current jail opened several years ago. Ed Hawkins, with the Fannin County Maintenance Department, researched replacement appliances for Kirby, and Kirby deferred to Hawkins’ recommendations. The industrial dishwasher found would cost the county approximately $20,000 and the new stove would run around $2,500. Helton motioned that the county replace both appliances for the jail, Post 1 Commissioner Earl Johnson seconded the motion, and all three commissioners voted in favor of the new appliances. Commissioners re-entered into a contract with the Department of Family and Children Services (DFCS) regarding funding from the county. No representatives from DFCS were present to discuss this funding. Sherry Morris, director of Fannin County Family Connection, Inc., was present to ask the BOC that Fannin County continue to serve as Family Connection’s fiscal agent. 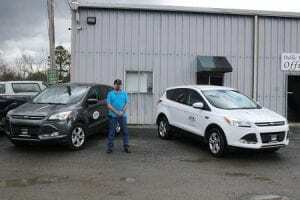 Post 2 Commissioner Larry Joe Sosebee inspects the Tax Assessors new vehicles at the Fannin County Public Works Department. Morris updated the board on services provided through Family Connection during 2017. According to Morris, 105 people were served through the pantry. This number is actually down about 9 percent from 2016. Chief Appraiser Dawn Cochran from the Fannin County Tax Assessor’s Department presented the BOC with a number of bids for two new vehicles for her department. Two used vehicles will be purchased from North Georgia Ford. The 2016 Ford Escapes will come with a price tag of $20,000 each. Through negotiation, Cochran was able to receive a seven-year, 125,000-mile warranty on one of the vehicles, and an extended warranty on the other. The extended warranty will cover an additional 90,000 miles. After a long debate on the need for these new vehicles the board unanimously approved the purchase of the two used Ford Escapes.